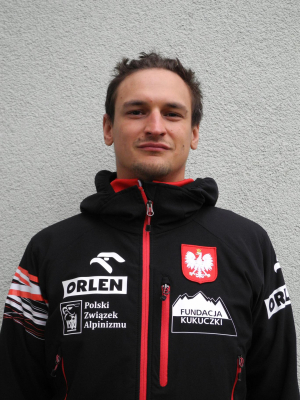 Adam Bielecki - Polish mountaineer. He was born in Tychy, Finish psychology on Jagiellonian University in Kraków. He climb in mountains from 1999. On account he has first winter ascent on Gasherbrum I (2012) and Broad Peak (2013). He climb also Makalu, K2, and Khan Tengri (At the age of 17, he was the youngest person). 2011, 30 września - Makalu, French Route. Team: Artur Hajzer, Adam Bielecki i Tomasz Wolfart. 2012, 9 marca - First winter ascent Gasherbrum I. Team: Adam Bielecki, Janusz Gołąb. 2012, 31 lipca - K2, Abruzzi Spur. Without use of supplemental oxygen. 2013, 5 marca - First winter ascent Broad Peak. Team: Adam Bielecki, Maciej Berbeka, Tomasz Kowalski, Artur Małek. 2000 - Khan Tengri. At the age of 17, he was the youngest person to climb Khan Tengri in alpine-style.